We extend a warm welcome to our friends from the Caribbean this evening and hope very much that they will enjoy their game with us. Their tour so far has not been too successful from the results point of view, but I am sure that that was not their main intention. I am sure it was to widen their football knowledge generally and to gain experience for their administrators and players alike. I hope that this experience has been gained. It certainly is an ambitious tour, and before they have left our shores they will have played against all types of our teams. In its conception it reflects great credit on somebody from the West Indies. We are the first professional club that they have met on their tour, and I hope they take back with them pleasant memories of our ground, our hospitality and our standard of football. We on our part are happy to meet them and to do battle with them on the football field and, though our worlds are far apart, to enjoy the comradeship that this great game of football produces. Eric Roy Robert James, M.B.E.. Manager. In private life Mr. James is Chief Accountant of the Trinidad Government Railway. He was made Honorary Secretary/Treasurer of the Trinidad Football Association in 1942 and from then to the present time he has held that position. His energy, organisational skill and his successes have won him a legendary reputation as an organiser in the field of sport. He is the founder of the British Caribbean Football Association, which was inaugurated in 1957, in Kingston, Jamaica. The climax of his work is the organisation of this tour, the first West Indies team of footballers to visit Britain. It is no exaggeration to say that without his vision, wide acquaintance with the West Indies and knowledge of football organisation, the tour would not have been possible. A. George Abrahams. Assistant Manager. Mr. Abrahams is Assistant Secretary in the Ministry of Development, in the Government of Jamaica. He is Honorary Secretary of the Jamaica Football Association, a position he has held for many years. Jamaica is the largest and most populous of the West Indian Islands. Mr. Abrahams thus holds a big position, and he was responsible for the organisational conference which led to the inauguration of the British Caribbean Football Association in Jamaica in 1957. Since then he has organised several tours in and out of Jamaica. Noel C. Pouchet. Trainer/Coach. In private life Mr. Pouchet is in the Sales Department of one of the largest firms dealing in automobiles in Trinidad. On leaving college he played for one of the foremost Amateur Clubs in Trinidad—Notre Dame. He retired early from active participation and devoted himself to a comprehensive study of all aspects of the game. He became a member of the Port of Spain Football League Council, and also a member of the Council of the Trinidad Football Association two years ago. Gomez, Patrick Elton. Captain. Born 6th February, 1930, Trinidad. Height 5ft. 9in. Was educated at St. Mary's College. He was seconds Goalkeeper on the 1953 Tour to Britain of a Trinidad team. He gave some magnificent performances during that tour, especially against Bristol Rovers. His hands are safe and his anticipation almost faultless. He has captained his Club side in Trinidad (Casuals) and captained Trinidad at home. Rodriguez, William Vincente. Nicknamed "Willie." Was born on the 25th June, 1934, in Trinidad. Height 5ft. 10½in. He attended St. Mary's College in Trinidad and obtained the Senior Cambridge Certificate. In cricket, he represented the West Indies in India and Pakistan. He is a very versatile player specialising at Back and Centre Half (Stopper). Balanced, cultured, and an artist in the use of the ball, he is a model of constructive full back play. De La Bastide, Tyrone Carl. Born in Trinidad 17th October, 1938. Height 5ft. 4½in. Educated at the St. Mary's College in Trinidad and obtained the Senior Cambridge Certificate. Another youthful member of the side. Represented the College in Jamaica, and played his first representative game for Trinidad in 1959. On the small side for a defender, he is nevertheless fast. Tackles hard and is quick in recover. Aleong, Edward Kelvin. Born in Trinidad, 4th May, 1937. Height 6ft. Educated St. Mary's College, Trinidad; holder of the Senior Cambridge Certificate. Represented Trinidad at home. A good ball player, he is not afraid to move into attack. His balance, poise, and delicacy of his control is delightful to watch. Has a powerful drive to goal from outside the area. Hope, Montague. A centre-half who can tackle firmly and distribute well, he is untiring and seems to be always there to intercept. Can fill the berth at right- or left-half equally as good and therefore a most useful half back. Commended his career in 1954 for St. Barnabas Football Club after coming from the Regional Youth Council junior team. He has been capped for British Guiana on four occasions—twice at home and twice abroad. Largie, Carl Ashton Lascelles. "Digger," as he is familiarly know in Jamaica, is 31 years old. He was educated at St. George's College in Kingston, Jamaica, and represented Jamaica in Haiti in 1950 and Trinidad in 1958 and 1959. He is a half back who can play at right half, left half, or centre half. He is a very experienced player and is expected to be very useful on a tour of this kind. Leggard, Leonard. Born in Trinidad, 19th January, 1930. His height is 5ft. 4½in. Educated in Trinidad at the Belmont Primary School. Represented Trinidad at home in 1959. Had a very good season for his local Club which culminated in his selection for his first tour away from home. Is full of confidence and makes good use of the open spaces. His hobbies are reading, movies and swimming. Haynes, Reginald F. Born 22nd November, 1931. Represented Barbados against British Guiana in 1953 and 1954; against South Trinidad in 1957 and 1958. Took part in the recent Quadrangular Tournament in order to select the team for this Tour. He displayed good ball control and is more than useful as a right side player. He is expected to do well in the Tour. Corneal, Alvin Ainsley. Born in Trinidad 13th October, 1937. Height 5ft. 8½in. A very versatile forward particularly on the left side. Represented Trinidad at home in 1959. His maiden tour abroad. A natural ball player. Is fast and has great power in his left foot. Also a very useful all-round cricketer. Swimming, dancing and table tennis are his hobbies. Gray, Ronald James.Born in England on the 13th October, 1939. One of the youngest members of the team, is now resident in Trinidad. Educated at the Trinity Academy School, Pointe-A-Pierre, Trinidad. Cambridge Overseas School Certificate. Height 5ft. 9½in. A clever player who oft-times splits a defence. Very dangerous in the area with his head and feet. Parker, Alan Owen. Born 21st September, 1932. 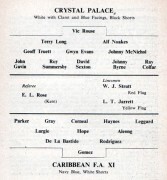 Represented Jamaica in 1953 against the English Football Association. Played for Jamaica against Argentine, Zurich and Milwaukee; also visited Haiti. His first position is outside left, but due to the fact that he is able to use both his feet to advantage he can also fill the role of centre-forward.